Line a large bowl with a square of clean muslin (or cheese cloth). Place yogurt in the centre and wrap the muslin around the yogurt and tie up with string. Suspend the muslin and yogurt over a deep mixing bowl and place somewhere cool. Leave the labneh to drain for at least 4 hours. This will make approximately 350g labneh. 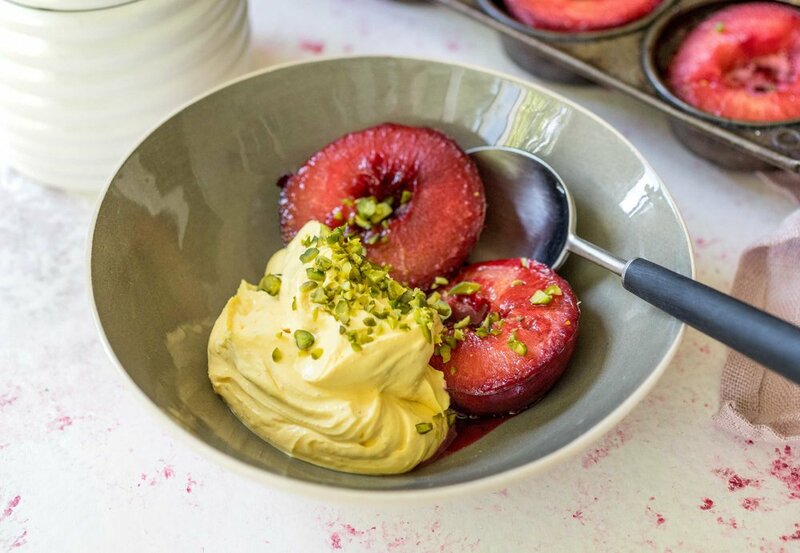 Place the plums cut side up on a baking tray or bun tin and drizzle with honey. Place the tray of plums in the oven for 10 minutes and cook until they are soft and their juice bubbles from the skins. Finely grind the saffron. Mix with a teaspoon of freshly boiled water and set aside to infuse for 10 minutes. Remove the seeds from the cardamom pods, discard the husks and finely grind the seeds. Fold together the labneh, ground cardamom, icing sugar and cooled saffron water. To serve; divide the plums among 4 serving bowls. Top with the saffron labneh and sprinkle with the ground pistachio nuts. If you do not have time to make the labneh use thick Greek yogurt instead.